I've always said that if Henry Ford hadn't done it, I would have invented the assembly line. Looks like you're another one who works the same way. Very, very efficient and way more fun because you have the milestones of accomplishments all through the process! This is a very informative post! I've always wanted to make a display like this (I actually have a door like that picked up from a garage sale just waiting to be used). This is just the boost I need. I really have to get on the ball and get to making more stuff for the holidays. I like your process of having the pairs all together in one place! Thanks for a great post, Lori! Great ideas - Thanks for sharing them with everyone. Love the cards Lori! We have not decided to use them or not yet. We use the tall shutters [louver door type] at our out door shows and at least 1 of our indoor shows. For the out door shows we are now using shepard hooks for support. We zip tie them just like you do and it works really well. We also use the shutter style for our tables. 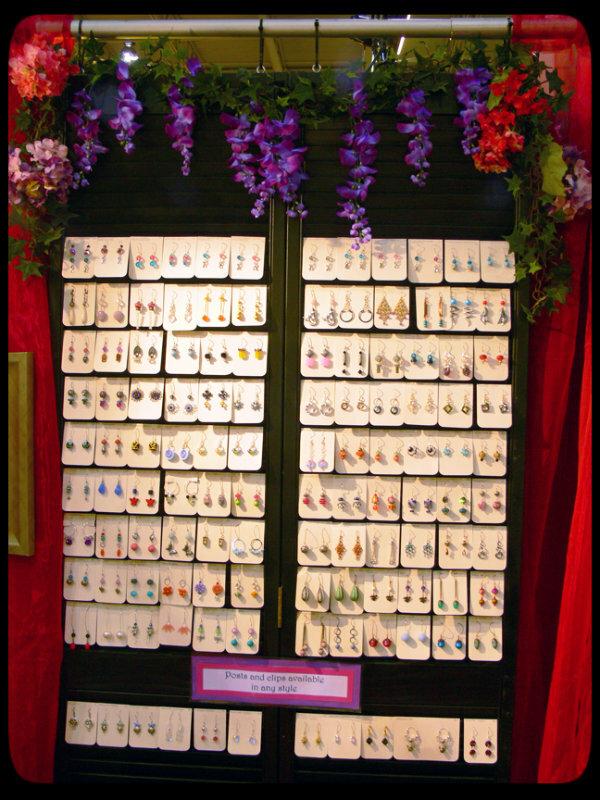 we have heavy clamps that you can hide pretty well and then we can get a great look and lots of display space while not taking up a lot of actual space. Thank you Lori for this post, it`s so timely for me as I am planning for my first show on December 1. I love the tackle box idea. Brilliant! OH, could you also send me your guidelines for the earring cards. Thanks!! I have seen your setup in person at the Dulles Expo and it is so pretty and inviting! LOVE your idea of keeping lampwork pairs in a tackle box! Am going to start doing that! I, too, am curious as to the type of paper you use for your earring cards...I am using card stock...it's only 65lb weight, but it seems to work...so far...Thanks for sharing your tips! Fun post! Thanks for the tips. The doors aren't in the shutter section of Lowes, but in the closet door section. We spray painted ours (and the back with the plywood). I can give you exact measurements if you're doing the standard doors, but basically, I measured across the length of one shutter and divided it evenly (I get six across each side). I made the height so they covered three slats AND added about two inches for the folded part that goes into the slat.
. I use watercolor paper but you can use card stock, what have you. First, I cut the strip of paper. Then I change the blade to the scoring blade and score the length for the fold. Then I go back to the cutter and cut each individual card. It sounds like a lot of work but you can get into a rhythm and you'd be surprised how many you can make in an hour. The corner rounding I can do in front of the TV. I used to use www.packasmile.com but I don't recommend them. I've had three break. Not acceptable for as expensive as they are and they were NOT responsive when I asked what to do. So I just use a darning needle to punch my holes, and it's easier for me because I can punch higher if the earrings are longer, and diagonal if the earrings are very small and I want to "fill up" the card. 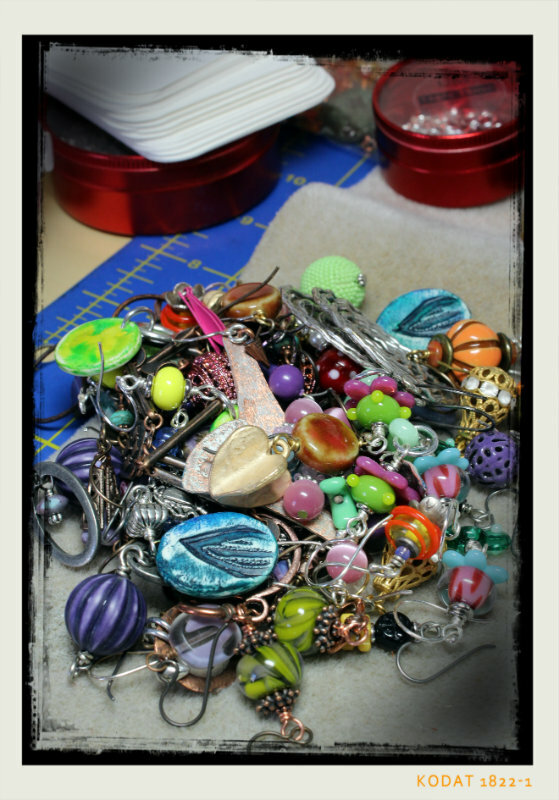 I thought I was the only one to make earrings in a pile like that and add the ear wires at the end. I've got my big show next year, so that's what I'm doing now! Clever husband with the shutters! It makes a great display, very professional. Love that tackle box idea. Thanks for sharing that. Thanks for all the great info, Lori! Hi Lori, I'm a new follower and also recently joined the Bead Soup Cafe on FB. Thank you heaps for this post - I have my first show in 2 weeks time and am just on the earring creating at the moment. Great post Lori, and so useful as I am trying to get ready for my first show! Lori, Thanks for this. Very creative and pretty display. Awesome post Lori! Thanks for showing and sharing your set up -it's great and I love how nice and neat it looks, too. 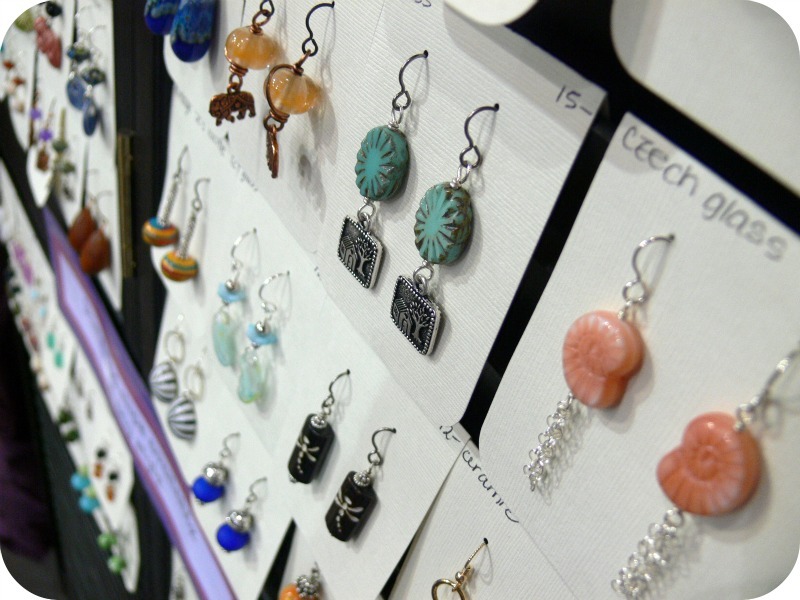 Love the 'assembly line' way you make your earrings,...it does help to have a system in place for production, that's for sure! You are so organized! I have one of those boring round displays that spins. I was at the Habitat for Humanity store one day and they had pink shutters. They were smaller, like maybe they were on a play house. I should've gotten them but didn't! I still kick myself to this day. This is great information, thank you. My question is how do you store your cards between shows? Do you leave the earrings on the cards? Do you leave them on the shutters? Great ideas...I will be using this one!! Super idea I will be using this one!